Considering a new floor ? Still having a hard time deciding what material will be best for your home ? While the initial cost can be a little bit higher and might discourage you from buying it, benefits of wood flooring will eventually outweigh this initial additional cost. Good quality wooden flooring will last for decades. Unlike carpets that need replacing approx every 5 years, due to everyday wear and tear, you will find that good quality hardwood flooring will need a minimal maintenance program and will look better as the years go by. Even if after a few years your wood floor has been scratched due to heavy wear and tear, sanding and sealing will bring it back to new again. It will also be less costly than refitting a new carpet. Unlike ceramic tiles, wood will not make you catch your breath the second you step onto it. The Wooden floor might not be as warm as some carpets, but it maintains a comfortable ambient temperature. The reasons are here fairly obvious. Mud, dump, crumbles… A simple brush, mop, or vacuum will do the job quickly and leave your floor looking great. 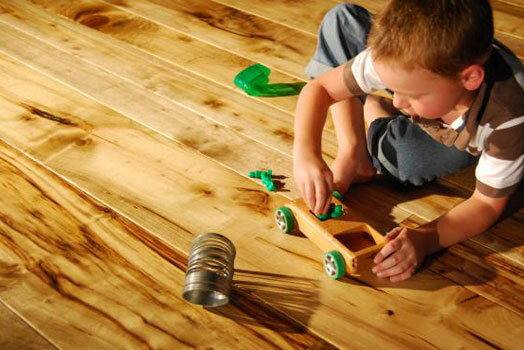 Without a question, wood flooring is more hygienic and healthier for you than carpets. Toxic pollutants, dust mites, fleas, mould, and other parasites can be dangerous to your health. Thay will play havoc especially with allergy sufferers who own carpets. Some of the reports out there detailing the parasites that are harboured by carpets will definitely make you think twice about your health and flooring choice. Not only wood floor is more hygienic, but unlike carpets, it won’t trap in unpleasant odours from animals or other things that have been spilt. One of the most important advantages of a hardwood floor is that timeless appeal that wood has. Linoleum, carpet, tiles patterns will definitely go in and out of fashion. Think of what we had in the 80’s. Wood has lasted hundreds of years and it does not look like this is going to change. Stone or tiles might be as hygienic and easy to maintain as wood, but they don’t have the same warmth and one in its kind feel that timber floors have. Timber flooring can also improve the acoustics in your room. Wood reduces hollow sounds and even vibrations. This is one of the reasons why dance studios and music halls install wood flooring over other kinds of material. Increasing the acoustics in your home can also add a benefit to your home cinema sound system. Estate agents report that houses with wooden floors sell easier compared to houses with other floor finishes. There is no doubt that the value of your house does directly increase as a result of fitting a hardwood floor. Think carefully before you choose your floor finish as it might affect your and your family’s health. The outlined benefits of wood flooring are clear. And even it costs a little more upfront, in the long run, wood is also vastly more economical. It simply is one of the most sought-after amenities in a home.